I've been practicing yoga for 15+ years, but more seriously for the last 2 years. Yoga was always part of my life on some level, but when I moved to Santa Monica from New York about 2 years ago I found a new commitment to the practice. 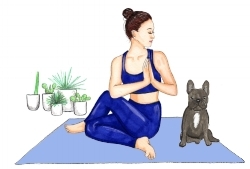 At first I was going to the studio as a means to exercise and de-stress after a long day at work and commute in Los Angeles traffic, then as a way to meet new people - the yoga studio became my community, then as a teacher-in-training and now because it's part of my life I can't live without (like food or Netflix). Yoga has opened me up to new possibilities, challenged me in ways I never thought possible, helped me to become more vulnerable, strengthened my body and my connection to myself. What if I've never done yoga... ever?